In this post, I recount my experience at the Peak Epic Sportive, which took place last Sunday (23rd June) in the Peak District. Today’s joint sponsors are the driving rain and the howling wind. I would also like thank my friends: mental torment and exhilarated exhaustion. This post is part of a series of sportive reviews, which I hope to build up as I ride in more events. As I’ve said before, these reviews are not intended be exhaustive accounts. Instead, I aim to give a flavour of the event, from my own perspective as a (very) recreational road cyclist. Hopefully, from this, you’ll be able to decide whether you’d like to take part in future runnings of the event. The official website for the sportive, including a description of all the climbs (if, like me, you’re into that sort of thing) can be found here. To steal (and mangle) a phrase from a popular brand of woodstain, the Peak Epic does exactly what it says on the tin website. The ride takes place in the Peak District and it is Epic*. *Confession: Since I only did the short route, and my ride partner, Adam (brother-in-law-to-be), did the medium course, I have to take the organisers’ word for the true level of ‘Epic-ness’ for the full monster version. All three routes started and finished in Bakewell. The short course followed a loop north-west from Bakewell to the feed stop at Litton (a village near Tideswell) before striking south-west to cross the moor. Just before Longnor (at a village called Earl Sterndale) the route turned back eastwards towards Bakewell. The medium route shared the same early miles (and first feed stop) as the short course, before heading north to complete a wide loop around Buxton, passing through Chapel-en-le-Frith and Whaley Bridge. 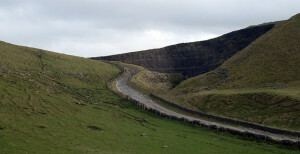 After turning south, the route rejoined the short course at Earl Sterndale. The long route shared the start, finish and middle section with the medium course, but introduced further large loops (and many large climbs) in the Hope valley and, in the latter third of the course, towards Macclesfield. Detailed route maps, along with elevation charts can be found here. In short, the course was hilly (what else were you expecting?). Peaky. Peaky and Districty. The weather on the day was terrible. Wind and rain lashed down for most of the ride. Despite this, and even viewed through fogged up glasses, the scenery was beautiful. The Peak District has two broad flavours: green, tightly-packed dales and dark, bleak moorland. All three courses offered up a taste of both, although the experience of climbing up a wooded hillside, protected from the elements, was more pleasurable than fighting across the rainswept moor. Mindful of the need to protect a fragile knee, I opted to do the short route. Despite it’s ‘mini’ status, I still found the amount of climbing challenging, yet enjoyable. The first climb out of Bakewell, with its switchbacks and the odd steep ramp gave a taste of what lay in store. The climb up to and along Longstone Edge was glorious and I’m keen to do it again. I tried to get Adam to describe his experience of the medium course. Even now, he is probably still coming to terms with the murderous conditions up on the moors. He was able to relay that there was a vicious climb right after he’d dropped down into Chapel-en-le-Frith. It was clear from his semi-broken body language that there had been demons to conquer out there. This was my second sportive organised by Dark and White. As was the case previously, organisation was excellent. The short route was well signed, despite nature’s best attempts to blow away the arrows (although Adam did say that a poorly-signed junction on the medium course meant that he and two other riders did an additional, and unwelcome, 2km of climbing before realising they’d gone wrong). The start and finish facilities were based in the Agricultural Centre at Bakewell, which is a great building for these sorts of things. There was plenty of space for the register queue to be inside (and out of the rain). There were large banks of windows against which bikes could be leant (and kept an eye on) whilst riders hoovered up the post-ride cakes and coffee. The feed stations were well stocked with bananas and biscuits, as well as a range of more sophisticated gels, powders and bars. The stations were manned by staff that seemed to remain enthusiatic despite the incessant rain. The only negative (or at least something to be aware of if you plan to take part in the future) is that the parking was not free. There is plenty of parking at the Agricultural Centre, but it costs £5 for any stay longer than 4 hours. Make sure you bring along the necessary change. The key questions really are, would I do the Peak Epic again and would I recommend it to others? The answers to both are yes! Despite the heinous conditions, I thoroughly enjoyed the ride (which I can say now, from the dry warmth of my house). I definitely intend to sign up for next year’s event and hopefully I’ll be in a position to do the medium event. The Peak Epic offers a great opportunity to participate in a challenging cycling event in the heart of the beautiful Peak District, along carefully-selected routes, with well-organised facilities and support. You can’t really ask for much more than that! Similarly, if you did this event and would like to add anything, use the comments section. Tomás Metcalfe liked this on Facebook. Tony Tinkerman Collins liked this on Facebook. Wow, that sounds like some ride! Even the “mini” ride sounds tough. Lots of climbing and a challenging course, not to mention the weather. Those days are great…in the aftermath. Great review of the ride. Thanks Brian. I’m looking forward to stepping up to a longer route for my next sportive! It was pretty miserable up on the moor, but did get better. Nothing a large Sunday lunch in Bakewell didn’t solve…!